Age doesn't matter when it comes to helping our family. Even at a young age, there are small ways we can help our parents to provide something on the table. For the love of family, nothing is impossible and unattainable. A first-time gold medalist from Misamis, Oriental inspires us to keep our hopes high in achieving our dreams for our family. 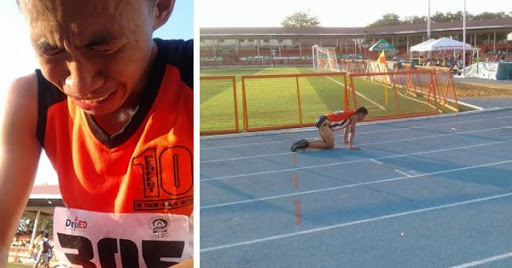 Erwin Mancao won as a gold medalist in 61st edition of Palarong Pambansa held at Ilocos Sur. The long distance runner is the first to cut the finish line with 16:01.60 in the 5,000-kilometer run. The winners in the event will be given gold medals from the Palarong Pambansa itself. However, to inspire the athletes to do their best, some officials put a twist on the event. PTV Ylocos reports that Region 10 (Northern Mindanao) officials verify that athletes who will triumph gold medals will receive P20,000 cash from the Regional Department of Education office. The event is held at Quirino Stadium, Bantay, Ilocos Sur. Erwin Mancao, driven and determined to win, was able to achieve his goal. By the time he steps on the finish line crying, he nearly crawls on the track. The secondary high school student cried not just because he finally got a gold medal but he can now help his parents in building their house. According to the young man, his mother is a house helper, and his father works in a niyugan. Erwin is from Looc, Misamis Oriental and attending to Villanueva National High School. The student-athlete has joined Palarong Pambansa thrice already. He has undergone training for several years now and enjoying the fruit of his labor. This is not the end but the beginning of many things for this young man. Who knows if someday we'll see him compete in Olympics, right?